Outlander for teens? - Yes please! 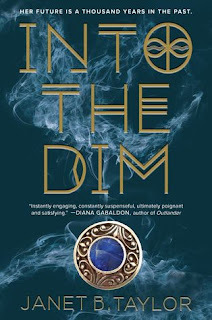 Into the Dim is told from Hope's first-person-perspective, and she does a great job as a reliable narrator. I thought she was a tougher character than her narration lets on. 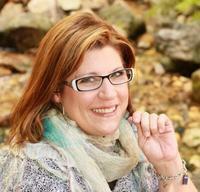 Readers will find her relatable and will root for her successes. The romance isn't too heated in this book, but I do believe Taylor has set up a potential love triangle for future books. Hope has two potential suitors: Collum and Bran, and the two could not be anymore different. Collum is by-the-book kind of guy, reliable- he'll always have your back. Whereas Bran is more dark, and mysterious, there's definite chemistry between him and Hope, but can she trust him? I look forward to where Taylor plans to take these three next. While I had a bit of a hard time getting into the book at the beginning, 40-50% of the way in the action picks right up, making the reader unable to put down this book. Just like in Outlander, I couldn't guess where Taylor was going to take Hope and the gang next! The plot was amazing, the setting, beautiful (although a bit barbaric). I also loved that the romance really picked up as well. The ending will leave readers satisfied, but hungry for the next instalment! I would easily recommend this series to those who love an equal blend of romance, action and adventure in their YA! Please bring on book #2! 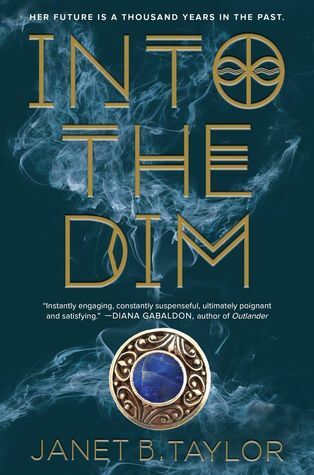 If you had to describe Into the Dim with three words, what words would you choose? Why? entire series is a very strong and true love. 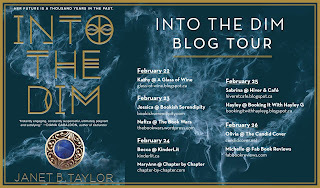 Huge thanks to Raincoast for allowing me to participate in this blog tour!